In a recent interview with G4TV, Naughty Dog Co-President Evan Wells talked a bit about the game's cooperative modes, and the possibility for adding content to them. Uncharted 2's co-op is broken down into three modes: Objective, Gold Rush and Survival. The objective mode is a bit like playing pieces of the single player game, except the environments require another person or two to navigate. It's a bit more like a traditional co-op experience. This is what Evan had to say in regards to more content like that. "The objective-style co-op that we have where we have those little narrative moments...it's something that we are considering and we'd really like to do, but it's a much, much bigger investment of time because we have to do a lot of motion capture with the actors and record a lot of voices. So we would absolutely want make sure that we talk to our community and make sure there was the proper demand for it." So if this was your favorite mode, you might want to speak up over on Naughty Dog's site and leave a note. The other two modes though, Evan leaves open to possibility. "So for future DLC, could we add more co-op? Probably more in the arena-style type of gameplay, like our Survival and our Gold Rush modes." This doesn't mean co-op is coming, or even in the works. In fact a Naughty Dog representative told us that they aren't moving forward on any of this. It's yet to be determined if there's proper demand for this kind of DLC, and if so, what kind of content should be created. 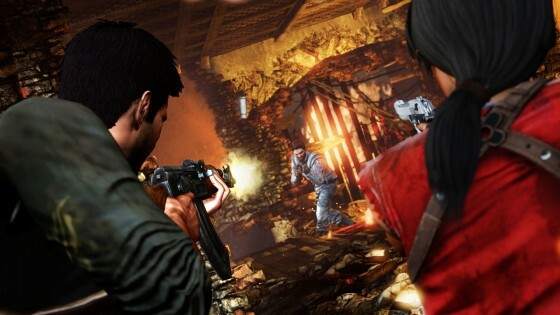 So if you want more co-op in Uncharted 2, any kind of co-op, you better speak up!